A stylish stool for behind tall reception desks, conference tables and drafting workstations. 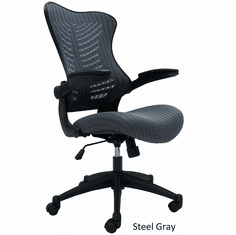 Features flip up armrests, tilt and swivel, a comfortably contoured seat cushion and a breathable mesh backrest. In stock for immediate shipment in Steel Gray, Spring Green or Raven Black! Stool ships unassembled. Shipping weight 40 lbs. 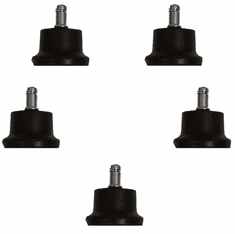 All components exceed ANSI/BIFMA commercial use requirements. Meets CA fire foam approval. 5-Year Limited Warranty. PRICE INCLUDES SHIPPING! IN STOCK! 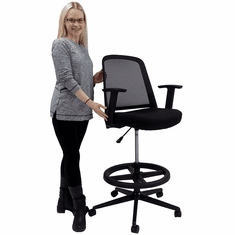 * Curved and contoured backrest for total ergonomic comfort. 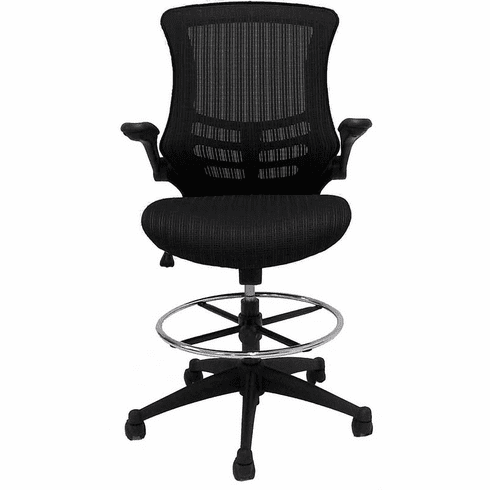 * Ideal for desks and tables 32"H � 39"H.
* Air-flo patterned mesh supports and keeps you cool. * Flip-up padded armrests are there when you need them and out of the way when you don't. * Contoured padded arm pads are easy on the forearms yet durable. * Superior 3" thick dense foam seat is contoured to the human form. * Attractive skeletal design backrest provides unique design from all angles. * Chrome adjustable height footring. * Tilt mechanism with tension control and lock out. 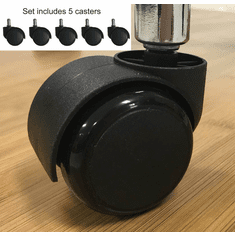 * Dual wheel carpet casters are standard. Optional soft wheel casters and floor glides are sold separately below. * Measures 26"W x 23"D x 43"-50"H overall. * Seat measures 21"W x 20"D.
* Backrest measures 19"W x 24"H.
* Seat height range is 22" - 29"H from top of seat to floor. * Seat Cushion Thickness: 3"